The Island Line Trail, Vermont. 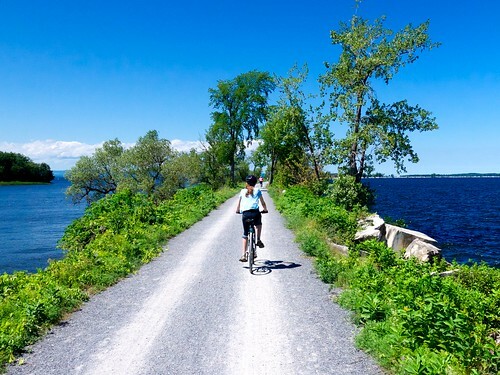 It runs along and over Lake Champlain (Burlington/Colchester/Causeway/South Hero Island). This photo was taken on the causeway, while headed toward South Hero Island. The causeway is about 10 ft. wide and runs for 4 miles. It's a unique ride, and the Vermonters we met were wonderful people. There are shops and farms on South Hero where you can get Vermont goodies: apples, berries, maple ice cream.